JoAnn Stratakos' cheerful gnome greets you for a cup of coffee each morning. Tucked in your kitchen cabinet there's a little fellow with a red hat and bushy beard. To coax him out you only need one thing: a fresh pot of coffee. Brighten each morning with JoAnn Stratakos' mug featuring a cheerful gnome. She throws each stoneware piece so that it's smooth on the outside and swirly on the inside (her signature design). Then, she sculpts the tiny gnome, placing a cherry red heart in his hands. It makes a heartfelt gift for coffee and tea lovers, or anyone who has your heart. Handmade in Pennsylvania. "I tend to make things I like, things I’d like to have around me," says ceramist JoAnn Stratakos. Once the concept is in place, she uses her knowledge and expertise to guide each piece. In her Pocono Mountain studio, she creates one-of-a-kind glazes, giving her designs subtle variations and unique characteristics. The color and shapes are designed to compliment, not compete. Its the impressive shapes and functionality that makes JoAnn's items truly special. Please note: This item is not available to ship outside of the U.S. This mug was an anniversary gift for my husband who is a Waldorf teacher. It's perfect for him in his classroom where he's storytelling about gnomes a lot. The mug looks beautifully handcrafted. My only complaint is the price - it is just a lot for a mug No matter how you slice it. Made my heart sing ! I saw the gnome mug and immediately was reminiscent of our family Swedish traditions. Delivery arrived sooner than expected . The packaging was top notch. Product was delivered perfectly . I would order more if I could ! I am reviewing this product in the hopes of getting the advertised $1000 gift card. That said I bought this for my sister in law for Christmas and she absolutely loved it. I thought it was a little too expensive for a mug, but whatever, it's only once a year and it was a good gift. 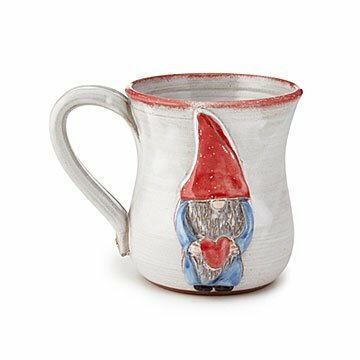 This gnome mug will blow you away! It holds an ample amount of coffee and the gnome just keeps you smiling!